Every once in a while I hear a voice whose sheer beauty stops me in my tracks. Such was the case the first time I heard Ana Egge in Bright Shadow. Ethereal yet down to earth, simple yet sophisticated, her soft, silky vocals seem almost effortless, whether she’s delivering a cool jazzy number or traditional, up-tempo Americana...a poignant ballad or a moody singer-songwriter original...as well as, of course, the edgy Lucinda Williams-style folk rock that distinguished her last album (produced by Steve Earle). But it is not just the diversity of styles that sets Bright Shadow apart from her previous work. With this, her seventh studio album (she has 9 albums altogether), Egge chose to be her own producer. She conceived the CD as a direct collaboration with The Stray Birds – a young, acoustic roots trio who have been gathering critical acclaim since the release of their first self-titled album in 2012. A strikingly talented trio of multi-instrumentalists and vocalists who have been friends since childhood, The Stray Birds consist of Maya de Vitry on fiddle, banjo and harmony vocals; Charles Muench on upright bass and harmony vocals; and Oliver Craven on mandolin, fiddle, slide guitar, and harmony vocals. When Egge met them at a Folk Alliance conference in Toronto in 2012, she knew it was a collaboration that was meant to be. The Stray Birds grew up listening to old-time roots music like the Carter family, and Bill Monroe and His Blue Grass Boys...the kind of music Ana Egge first played as a teenager in her high school bluegrass band. So, not surprisingly, the four artists had an immediate affinity for each other. And in Bright Shadow, The Stray Birds bring an intuitive appreciation for traditional folk to the mix...their sparse, subtle arrangements creating the perfect backdrop for Egge’s remarkable voice. The resulting authenticity of these ten tracks is mesmerizing. And it underscores the often otherworldly theme of many of Egge’s songs. Four of the ten songs are about, or reference, dreams....beginning with the first track, Dreamer. Opening with nothing but the jazzy rhythm of Charles Muench’s upright bass, and followed by such vivid poetic imagery as “First strike, snake bite,” it is a sensual, evocative song that can best be enjoyed – like many of Egge’s originals – intuitively. The album then bursts into an upbeat melody with fiddle and guitar, in a poignant rendition of Bryan Thomas’s Flat Top Guitar. It’s a wonderful song, written from the first-person vantage point of an old guitar, now largely neglected, but which had once been played by “those golden hands that made me wail and cry.” Spiked by addictive harmony, it is truly unforgettable as it captures the soul of a musical instrument, waiting to be awakened by the artist. The third song is yet another gem, this one an adaptation (and expansion) of a traditional song called Jenny Run Away. Usually played as just a fiddle tune, Egge’s arrangement adds an exciting chorus and story line about a run-away slave to the traditional tune. The story builds with captivating detail, summed up by the chorus, “Jenny run for her freedom, Jenny run for her life.” And the bluegrass-infused accompaniment of The Stray Birds keeps pace with the danger. Only in my dreams, why do I have these wings? 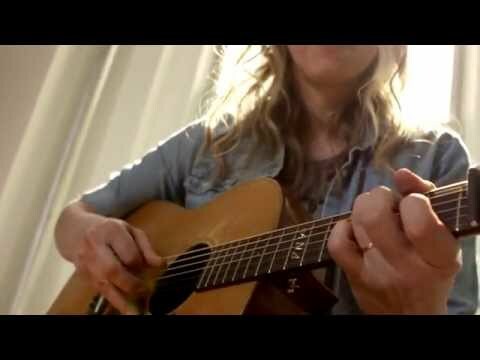 The spiritual theme continues in Rock Me (Divine Mother), co-written by Ana Egge and Gary Nicholson. Featuring an elegant, eloquent guitar and some truly divine harmonies, it contains yet another reference to dreams and the world of the spirit. Sadly, this song was completely shortly before the passing of Egge’s own mother this past year. Still other stand-out songs in this collection include a beautiful cover of Dolly Parton’s winsome song, Wildflowers, and a co-write with Mike Ferrio called Fifth of July, a poetic lamentation for what has become of our country. The final song, The Ballad of Jean Genet, about the French writer, paints a masterful portrait of gay discrimination, summed up by the powerfully understated line, “a man in love with a man.” Oliver Craven plays an incredible slide guitar on this track, underscoring the depression and desolation of this portrait. The poetry and simple beauty of Bright Shadow cannot be overstated. For those who are familiar with Egge’s work, you will hear her voice as never before – in this elegant, minimalist production with The Stray Birds. For those who have yet to hear her, you owe it to yourself to do so.